Test Stream Creation：Creation of unique test streams compliant with ARIB standards specs! We have created over 1,200 digital broadcast service test streams for Digital Terrestrial, BS, 1-seg and multimedia broadcasts. We conduct ARIB analyses to create test cases and test streams extracted from VALTES's own unique and abnormal case perspectives. We propose test streams that optimally suit client needs. （1）Study analyses：For the creation of required test streams, we first conduct studies and analyses of specification materials such as ARIB to clearly define the target range needed for test stream creation. （2）Using specification materials such as ARIB as well as VALTES' own additionally added perspectives, necessary check items are extracted and compiled into a checklist, yielding the attributes for creation test streams. 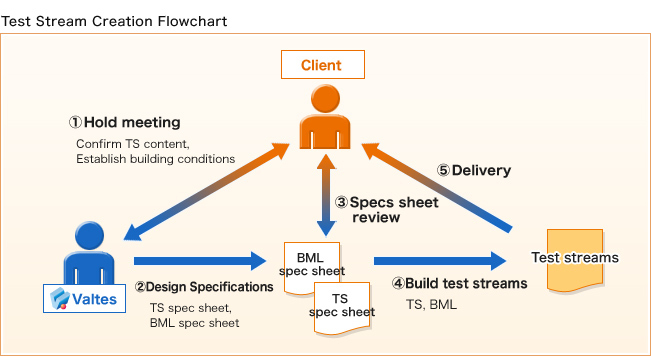 Test stream design is conducted and incorporated into a test stream spec sheet. We create test streams that respond to customer needs. ・"We can't make proper confirmations with our existing test streams." ・"What about when we need abnormal broadcast test streams?" ・"We need our own data broadcast contents (BML)." Etc. 1. Upon receiving an order to build a test stream, we conduct a hearings with clients to ascertain their needs. 2. Based on the contents of the hearing, we draft a TS specifications sheet. 3. We conduct a review of the TS specifications to make sure the contents accurately reflect client requests. 4. We build a test stream based on the TS specs. * We ask clients to prepare their own video/audio data. 5. We deliver to the clients the completed test streams. 4 Reasons to choose VALTES for your test stream creation. Our test engineers with their mastery of ARIB create the test streams themselves. Proposal of precise test streams based on ARIB knowledge and testing know-how. At VALTES, we have already created a total of 1,200 unique test streams for Digital Terrestrial, BS, 1-seg and multimedia broadcasts, having established a strong and independent stream base and test stream creation process that is efficient and meets precise objectives. At VALTES, we make it possible for customers to generate test cases together with test streams without needing to deeply understand test stream content. VALTES test centers are fully equipped with various facilities and devices for test stream creation such as signal generators, analyzers, TS creation tools and verification equipment.